I am afraid to admit that I am a registered nurse! No more RN jobs in Huntsville area? I graduated from school in May 2009, and have also passed NCLEX. I guess new grads seem to be a dime a dozen right now, despite the "nursing shortage". But I am wondering - shamelessly - if anyone knows of any employer who is hiring in the Huntsville area. I have worked at Huntsville Hospital as an EKG tech and Cardiology transporter for over 4 years. I have applied to pretty much every available RN job opening within HH ever since I graduated. I've had 4 interviews so far, but no offers yet. I've applied to many jobs at Crestwood and Decatur General as well, and so far have heard nothing back from them. I've also sent my resume and/or applied to other facilities both in this area as well as Florence, Gadsden, Scottsboro, and Cullman. Ditto in Tennessee: Fayetteville, Columbia, Smyrna, Murfreesboro, Nashville, Chattanooga, Franklin...and still no responses. I also contacted a nurse recruiting agency, and had a weird experience with that. About an hour after I emailed them my resume, they called me and gave me a cheerful description on the phone of how easy it would be to find me a job. I told them that I was a new grad, and they said that would be no problem. Then about 2 days later they sent me an email saying that they don't normally work with new grads, and that I should NOT seek the services of a nurse recruiter. Which, that's fine with me, but I didn't understand why they initially told me quite the opposite on the phone. I guess it's frustrating because I know that some people in my class have already gotten jobs at Huntsville Hospital despite the fact that they didn't already work there, or they worked for a much shorter period of time than I have. I am not angry towards those people, because I know very well that each of them will make great nurses, and I'm glad to have them working there. However, I just wonder what it is I'm doing wrong. I also know of at least 2 other people from my class who have also been long time HH employees, and like me are still without a nursing job, despite applying frequently. Maybe it just boils down to the luck of the draw. I am confident that I will find SOMETHING eventually, but in the meantime if anyone has any leads or tips they'd be willing to share, it would be most appreciated. You are welcome to respond here or PM me. Thanks; sorry was this so long, and hope everyone is having a great day. I enrolled in the RN program in fall of 2007 along with Jamie2887, and just graduated this past May. I myself had 199 out of 200 points. I don't recall exact figures, but many people I knew in the program told me they had as low as 160-something points. I don't remember anyone saying they had much lower than that. When I enrolled in the program, my understanding was that there was no specific threshold of points that was required; the way it worked is that they took in the top X number of people who had the highest number of points. In other words, everyone with 200 points had first priority, everyone with 199 points had second priority, and so on down the line until all available spaces in the program were full. That criteria may of course be changing this year or anytime in the future. I hope this makes sense. Good luck! If you have any other questions, feel free. Could you new grads that had trouble with job search do me a favor. I've been working at my hospital as an EKG tech for 4 years now, all during nursing school, and I still can't get a job as an RN there. Granted, I have only just graduated this past May 15, 2009. However, I'm seeing other people from my graduating class who have never worked in healthcare before getting jobs at my hospital. While I'm happy for them, I'd be lying if I said I wasn't feeling a bit disappointed. Maybe I'm doing something wrong. If so, I would love to know what it is. Actually it's a question from an NCLEX study guide: A client is recieving an eye drop and an eye ointment to the right eye. The nurse should: A. Administer the eye drop first, followed by the eye ointment. B. Administer the eye ointment first, followed by the eye drop. C. Administer the eye drop, wait 10 minutes, then administer the eye ointment. D. Administer the eye ointment, wait 10 minutes, then administer the eye drop. What do you think? Thanks, JDCitizen. Btw, what do you mean by "SOP"? Question for the Nashville RNs out there. This is kind of a lengthy question, but I'll try to make it as brief as possible: I am about to graduate as an RN. I live in the Huntsville, AL area. 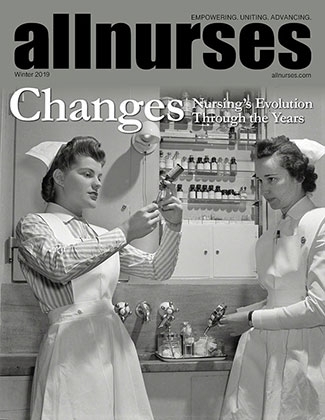 Jobs for nurses are here, but they don't seem to be as readily available as they have been in the past. Example: This area's biggest employer for nurses, Huntsville Hospital, only has about 13 RN job openings listed on its website right now (whereas up until a few months ago, they consistently had 80, 90, 100 or more jobs open at all times). Huntsville Hospital says that it's having to cut back on hiring due to the poor economy. I hear that other hospitals and employers are saying similar things. My question is - does the job market for RNs in Nashville seem to be going through a similar problem right now? Or are the jobs still fairly easy to find? I've lived in Nashville twice before over the years, and now that I'm about to finish nursing school, I'm considering looking for work there. From what research I've done online, it looks like the jobs might be slightly easier to find in Nashville than here, but I was just wanting to get some personal feedback on this from any local RNs. Thank you in advance! Based on everything you described, I think you did an EXCELLENT job. I imagine that I probably would have done precisely the same things that you did. I'm not sure I see what, if anything, you actually did wrong. From the way you describe, you were not "stopping the RN from going home" - you were simply providing her with information about this patient. It's interesting, btw, that this nurse's response was "I'll let the new RN deal with it". I wonder what your nursing instructor would have thought if you had said "Well, this isn't my patient, so I'll this let patient's student nurse deal with it." I'm not saying the outgoing-shift nurse was saying or doing anything wrong by any means, but still. I'm also wondering if by chance the doctor didn't pull either your instructor and/or the charge nurse aside and ask "Why did you have a student - who cannot take phone orders - page me?" Your instructor and/or the charge nurse may have then felt a bit embarassed, and hence in the heat of the moment your instructor pulled you aside and said what he said to you. Which, if so, I'm not saying anybody did anything wrong here; it's just that some petty emotions flared up a bit, and you happened to get caught in the crossfire. I imagine that if you had NOT taken the actions that you did, you could have just as easily been pulled aside and reprimanded for not having done enough. And that kind of reprimand may have been even worse of an unloading on you. I'm also wondering why the new staff didn't simply take the stairs. In any event, what if, hypothetically, this patient coded and died? Would you have been held responsible for anything in court? I doubt it, based on your actions. The hospital, though, probably would have been in SERIOUS trouble, esp since you had done them the silly inconvenience of actually alerting them to a problem with one of the patients. Whereas, had you NOT spoken up, the hospital probably could have legitimately claimed that they were not aware of the patient's status and/or unable to adequately address it, and hence they would be off the hook. The result of THAT would have probably been good for the hospital...probably not so good for the patient and family, though. I think you did all you could. I honestly can't imagine what else you could have possibly done. I'm just a student like you, so maybe I'm missing something here, but at the very least I simply can't imagine you "relaxing" or simply doing nothing in a situation like this would fly over well on a test question. I understand that as a SN you are not an employee, and there was probably a world of finer legal concerns at work here. But the thing is, you went to people who WERE employees (nurse, charge nurse, etc.) and you complied with what they asked you to do. Okay. I guess I was thinking that your description of "Nursing Supervisor" is more of a description of a "Nursing Manager". Is there a difference between those two, or are they one and the same? Sorry, just wanting to be clear. I have talked to people who have gone through several nursing schools before they were able to complete their degree. Usually these are people who had to drop out and/or flunked out for various reasons. If your friend's acceptance into nursing school has been denied twice now, I guess I'm wondering what the reason for that is. If it's because of grades, she may need to try a different school. In my view, some schools have far more competitive criteria for admission than others. If she needs to raise her GPA, she may need to re-take some classes, and/or spend the next year taking other classes (even unneeded electives if necessary) to raise her GPA. I actually had to do that myself for the year prior to my starting nursing school. (ie, even though I had straight A's in all my nursing pre-req classes, my cumulative GPA was still too low for admission.) I also know of another student who flunked out after the first year. As she was preparing to re-register the following year to start over, an academic advisor at our school gave her the wrong date to be assigned for registration. As a result, she actually missed the registration deadline and is now having to wait another entire year all over again. But she's still determined to go back next year. Anyway, about your friend: I say if she's determined and willing to do what it takes, more power to her! I'm about to finish my two-year associate's, and at this point it has actually taken me over 4 years to do so (due to various circumstances). Your friend may need to do something else for the next year or so, but as long as she is willing and able to do so, there's no reason why she can't go back at some point in the future. I'm sure you've already thought about or discussed all these things with her, but I hope this helps. Just wondering what the difference between these two terms is. I see both used a lot in textbooks and in conversations, but I'm not sure I understand the difference. They've never been explained in class, and I feel that I ought to know the difference between the terms (esp since I'm about to graduate! geez..). Any assistance would be most appreciated. Thanks! Not trying to insult anyone - I'm just giving an honest opinion, which is what the OP was asking for. I live out here in Meridianville - have for most of my life - and I've been spit on/pushed/threatened by so many good ol Bubba types...I guess the movie just rings true sometimes.